NEW SHOP LOCATION FOR 2018! Only a few steps from the old shop we are now BIGGER and BETTER! 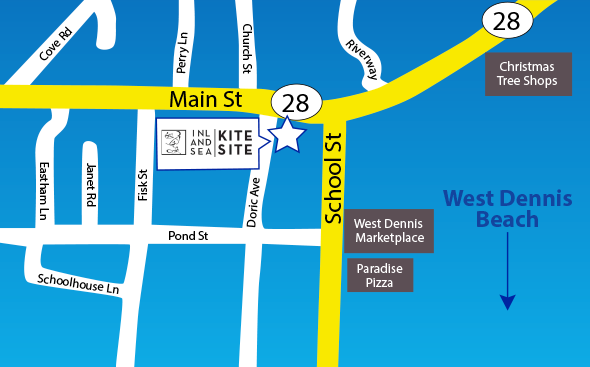 OUR NEW LOCATION at 291 Main Street (rt 28) in West Dennis! Inland Sea has been in business since 1996. We started in Vermont on Lake Champlain, and moved to our current location on Cape Cod close to West Dennis Beach in 2003. I have been windsurfing since I was 13 years old and have worked in the industry since the age of 16. I started kiteboarding after watching Robbie Naish and Don Montague riding in Maui back in 1998. We have also now included stand up paddleboarding to the water sports we are passionate about. Inland Sea has been built on a philosophy of matching the individual with the right gear for his or her needs at the best prices. I strive for excellence in customer service and still believe that there is nothing like an honest one on one conversation to help you choose the right gear for you. So pick up the phone and call me toll free at 888-465-2632 (888-inlandc) to discuss your kitesurfing/windsurfing/SUP needs. We have just launched this all new site complete with secure online ordering that I think you will find very easy to use. We are still adding a lot of items, so if there is something you don't see please give me a call or drop me an email. Follow I-95 North to I-195 East In Providence, RI. Follow I-195 East to Exit 22A Cape Cod Rt. 25 East. Follow Route 25 East to the Bourne Bridge. Go over the Bourne Bridge and go around the rotary. 3/4 of the way around the rotary take Route 6 East (Sign for Hyannis & Provincetown). At traffic signal follow signs (to right up ramp) for Route 6 East. Follow Route 6 East to to Exit 8 (Dennis). Take a right off the exit onto Station Avenue; follow until third set of lights (first two lights are within one mile, third set is a couple of miles further). At third set of lights, turn left onto Route 28. We are on the Right! Follow I-93 South to Route 3. Follow Route 3 to the Sagamore Bridge. Follow Route 6 East to Exit 8 (Dennis). (first two lights are within one mile, third set is a couple of miles further). Go over the Bourne Bridge and go around the rotary..
Inland Sea is Located right on route 28 in West Dennis. We are about 1/2 Mile from Great Windsurfing, Kiteboarding and Stand Up Paddleboarding at West Dennis Beach.